Grab a ping pong ball and enjoy a game of indoor skittles on a rainy bank holiday! Paint several polystyrene eggs with brightly coloured acrylic paint. You may find it easier to stick a wooden skewer in the base of the egg to hold it while painting. Cut a piece of coloured card 21cm x 8cm and wrap it tightly around a pen. Let the coil uncurl slightly until the tube is about 2cm across and glue the end down. Cut a piece of foam into the shape of a pair of chicken feet with their heels together and glue this to one end of the tube. Brush a thick layer of glue to the other end of the tube and fix the painted egg on top. Cut out two wings and a cockscomb from the same colour foam as the feet, leaving a 4mm long tab on each piece for fixing into the egg. Using a blunt knife, cut small slits in the top and both sides of the egg. Use a cocktail stick to push the foam pieces into place before gluing on a beak and wiggle-eyes. 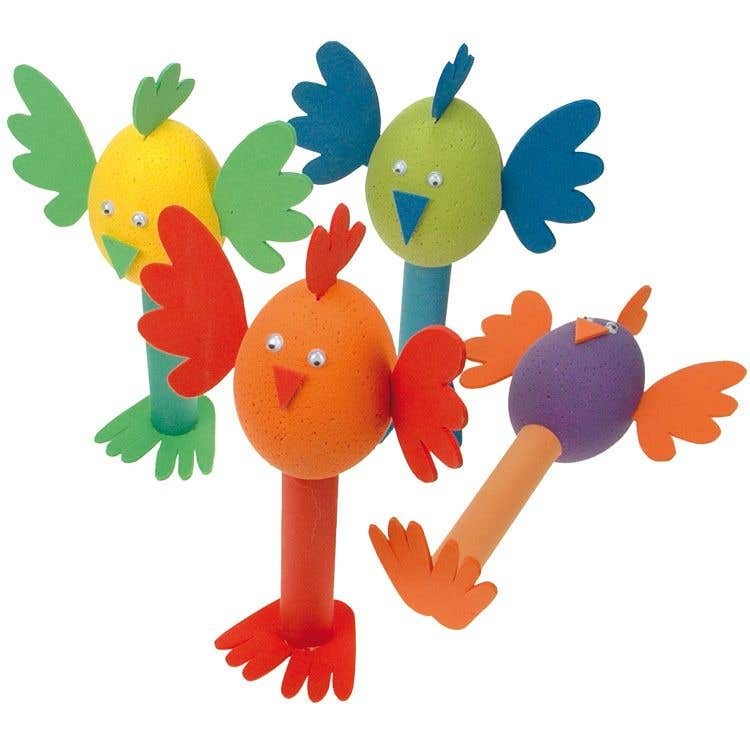 You could cut numbers out of foam and stick them to the chicken's tummies for a more interesting scoring system.